UP Aerospace launched the suborbital SpaceLoft 11 mission on Sept. 17, five days after launching Spaceloft 12 on Sept. 12, both as part of NASA's Flight Opportunities Program. The company considers the "double shot" mission a dry run for fast-paced missions with an orbital vehicle called Spyder that is under development. Credit: UP Aerospace. Updated Oct. 10 at 12:04 p.m. Eastern to include the correct location of Cesaroni Aerospace. WASHINGTON — Suborbital launch company UP Aerospace is halfway through funding an all-solid propellant rocket called Spyder that it hopes will meet government demand for missions that need to launch on short notice. 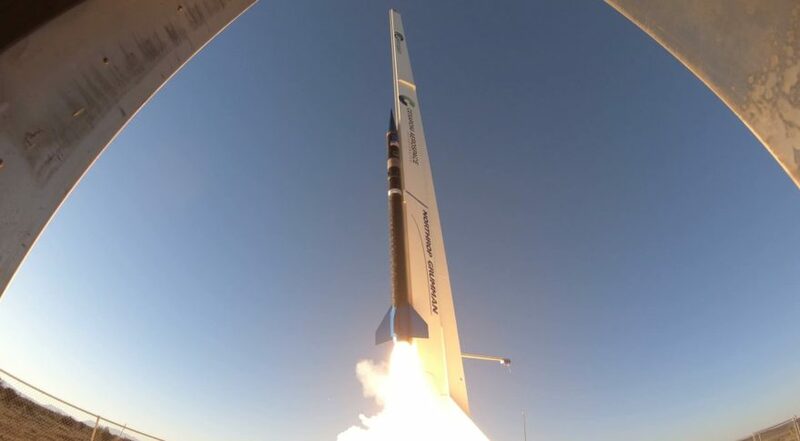 Colorado-based UP Aerospace did what amounts to a practice drill for such missions last month at New Mexico’s Spaceport America when it launched two suborbital Spaceloft rockets for NASA within five days. The launches showed that UP Aerospace’s seven-person team could do rapid launch operations as a small company, Jerry Larson, president of UP Aerospace, said in an interview. “We’ve been doing launch operations for 14 years now as a company, but this is the first time we’ve had a chance to do two of them back to back like this, he said. UP Aerospace is developing a four-stage rocket called Spyder it intends to debut in 2021 to carry up to 10 kilograms of payload to low Earth orbit for $1 million a launch. Larson said he expects around 80 percent of the rocket’s launches will be for military and other government customers, with the rest being commercial. At $100,000 a kilogram, Larson concedes Spyder “is not going to win any prizes” on a kilogram-per-kilogram basis — most small launcher startups are targeting $10,000 to $50,000 per kilogram — but says “the fact that it is a million dollars” for a dedicated ride should turn some heads. Larson and UP Aerospace hope that government agencies and small satellite operators who are looking for dedicated launches but don’t want to pay $7 million to $8 million for a larger vehicle like Rocket Lab’s Electron will find it easier and cheaper to come up with $1 million than to book a bigger rocket. The U.S. Defense Department regularly pays more than commercial satellite operators to launch military payloads on rockets from United Launch Alliance and SpaceX. The Defense Department has also attempted through several programs — Super Strypi, SWORDS and currently Boeing’s DARPA-supported Phantom Express spaceplane — to foster vehicles that could launch small satellites on short notice and tight schedules. Because Spyder uses only solid propellant, UP Aerospace could stockpile multiple launch vehicles and bring them into operation when called upon, Larson said. Rockets with liquid propellant, while higher performing, require cryogenic fuel storage, pressurized systems and other equipment that can make operations more complex, he said. Larson described Spyder as an extension of UP Aerospace’s suborbital launch program with Spaceloft, a vehicle the company has launched 12 times since introducing it in 2007. Most of the technologies for Spyder are already used in Spaceloft, which is why Larson estimates the orbital vehicle will only require around $10 million in non-recurring engineering to develop, of which around half has already been invested. Thanks to the commonality between Spaceloft and Spyder, UP Aerospace sees a rate of just one Spyder launch a year as sufficient to justify the investment, Larson said. Larson said UP Aerospace is self-funding the program, but would consider external investments if the need develops for greater production. UP Aerospace co-owns Spyder’s production site, the Space Propulsion Center at Spaceport America, with propulsion partner Cesaroni Aerospace of Sarasota, Florida. The two companies are using the facility to build space launch engines and military-grade solid rocket motors, with Cesaroni taking a larger focus on defense work. UP Aerospace and Cesaroni Aerospace are also co-designing the first stage of Spyder. NASA’s Marshall Space Flight Center in Huntsville, Alabama, is participating in designing the rocket’s second, third and fourth stages with the companies through a Tipping Point technology development contract awarded to UP Aerospace in 2015. While relying heavily on partners, Larson said Spyder is an UP Aerospace project and will be operated by the company alone. UP Aerospace plans to launch Spyder rockets from the Mid-Atlantic Regional Spaceport on Virginia’s Wallops Island, the same spaceport that Northrop Grumman Innovation Systems uses to launch Antares rockets to the International Space Station, Larson said. The spaceport’s location on the Atlantic Coast will allow Spyder’s depleted stages to fall into the ocean whereas launching from landlocked Spaceport America would require Spyder to drop its stages over potentially inhabited areas. Larson said UP Aerospace hasn’t decided on a final size for Spyder. The rocket is scalable to support launches of “hundreds of kilograms, if not a thousand kilograms,” he said. “Right now we don’t have a target for what would the next size Spyder be, but as the market matures over the next two to four years I think that will become clear,” he said. An advantage of a larger rocket would be a commensurate drop in price per kilogram to hopefully attract more commercial customers, he said. Over time, UP Aerospace will also seek to upgrade the rocket’s fourth stage, which will lack the orbital insertion accuracy of liquid-propulsion systems. The European Vega rocket, for example, uses three solid stages and a restartable liquid upper stage to guide satellites to the operator’s desired drop-off point. Larson said UP Aerospace has a roadmap to create a restartable fourth stage that will still be solidly propelled, but declined to estimate when that upgrade would be implemented. UP Aerospace is discussing the restartable upper stage with Valley Tech Systems, a Nevada-based company specialized in signals intelligence and propulsion systems, he said.